This sturdy and versatile tote is perfect for trips to the market and folds up for easy storage. 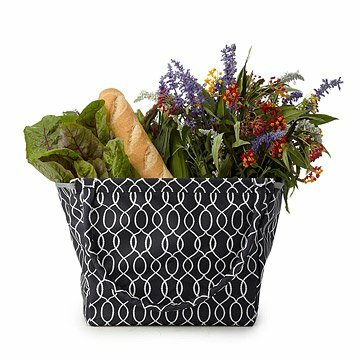 Whether you're hitting up the local farmers' market or picking up supplies for a weekend DIY project, this versatile tote is a handy companion for all your shopping excursions. Featuring a structured frame that folds for easy storage, this lightweight, washable design is able to hold up to 30 pounds, perfect for holding farm fresh veggies or hardcover library finds. Made in China. Hand wash, air dry, fabric is removable from frame. Great shopping bag; sturdy yet light weight; not bulky. This item folds easily, has a sturdy base and frame and holds just the right amount of groceries. Very sturdy. I love the foldable feature. Durable. Arrived quickly. Even prettier in person! I love the way it remains upright in the trunk. My daughter is in her thirties. She has always been very difficult to buy for since she is very particular. She goes to the local farmer's market almost every week so I thought this bag would be a good idea. When it arrived we skyped and she loved it. She said that after 36 years I finally got it right and sent her the perfect gift! This folding bag is sturdy and easy to open/close. It's colorful but not too loud and looks good around town. It's folds flat but still has a reinforced frame inside to assist in carrying heavier items. The only reason I gave 4 stars is because the edges were a little unfinished in a couple spots and the cushioned handles could be done a little better. Nothing too major, just expected it to be different. I used this as a gift for a friend who lives in the city. Her first comment was, this will fit in the basket on the scooter. I had a couple other gifts so I wrapped those and filled the market basket with tissue and added a bow to the handles. The greatest thing about this is the piece of heavy duty plastic on the bottom that unfolds to make a flat bottom. Genius! use it for carting everything from library books to food deliveries. very sturdy, attractive and easy to clean.